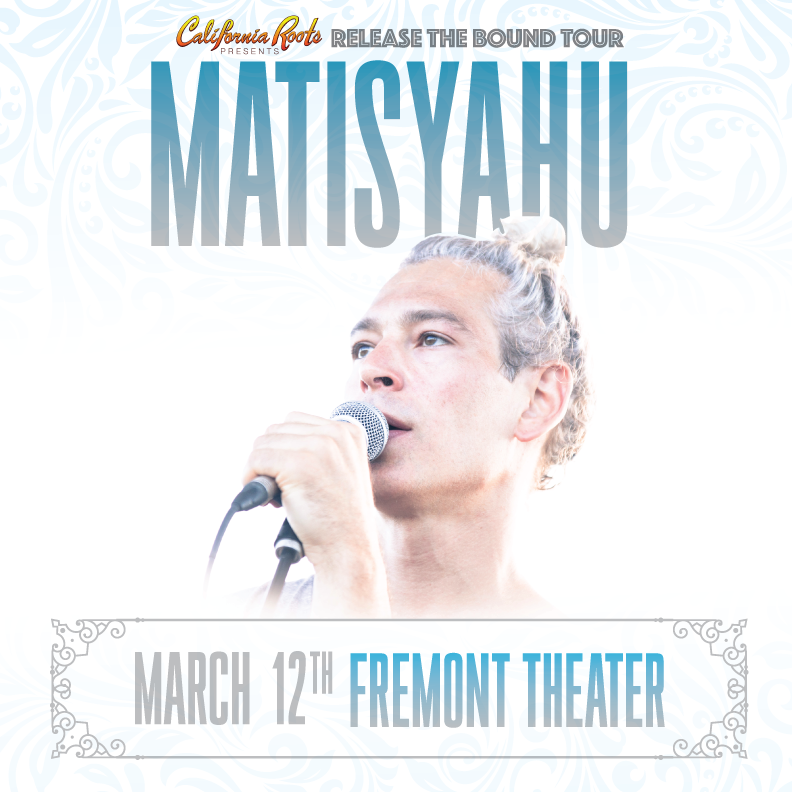 Matisyahu Release the Bound Tour - Otter Productions Inc. | Otter Productions Inc. Matisyahu Release the Bound Tour - Otter Productions Inc.
Matisyahu “Release the Bound Tour, coming to the Historic Fremont Theatre in downtown San Luis Obispo on Sunday, March 12, 2017. All ages. When Matisyahu first started touring to packed clubs more than eleven years ago, it was prior to the release of Live at Stubbs, the now Gold record, and prior to that record’s single “King without a Crown” reaching #1 on the alternative rock radio charts. His performances were a raw expression of his spirituality at that time and were supported by musicians who played a foundation of roots reggae augmented by the energy of a rock trio. 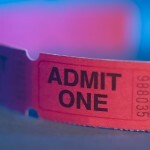 Fans latched on quickly for a variety of reasons, but in August of 2005, just months after the release of Live at Stubbs, Matisyahu found himself on stage at the Bonnaroo Music and Arts Festival with the de facto leader of improvisational rock-n-roll; Phish’s front man Trey Anastasio. Many early fans of Matisyahu remember that moment clearly not because of the songs he played in front of the 80,000 person crowd, but because of his seemingly unfettered confidence (or perhaps naiveté) in helping lead Trey and his band through an improvisational display of beat boxing and lyrical gymnastics during the two songs performed. It may have been unrefined, but Matisyahu’s passion for full band improvisation was laid bare. Fans within the improvisational-jam scene began flocking to Matisyahu’s shows shortly thereafter. “King without a Crown” climbed the charts and Matisyahu’s follow up record Youth was nominated for a Grammy, but the blessings and curses of mainstream success each took root. While Matisyahu’s bands have always been comprised of serious multidimensional players who have artfully molded the foundations of roots reggae into many genres, that early; if only a brief display of complete surrender to the music, seemed in some way to take a back seat. Through his lyrics however, Matisyahu developed a more personal, artistic, and sophisticated way to express the yearning for deep spiritual meaning, and as his own beliefs opened up to find more variety and depth, the desire for his performances to match the unpredictable flow of life developed as well. Now, more than a decade later, Matisyahu has formed a band that truly gives itself over to the music on par with his lyrical desire to connect to something beyond the self. The band features original Stubbs guitarist and longtime staple of the downtown New York improv scene Aaron Dugan, Dub Trio bassist and long-time Matisyahu collaborator Stu Brooks, percussionist and Cyro Baptista go-to-drummer Tim Keiper, and Addison Groove Project founder Rob Marscher. Combined, the music and lyrics transcend their parts. At its most basic moments the music now feels alive; an entity unto itself, being born in the moment and evolving each night. No two performances of a song are alike. At its most exultant moments the music becomes full-band improvisation. Lyrics are rearranged on the spot to serve the energy of the jam, no instrumentalist is playing simply to demonstrate individual skill, and Keiper’s percussive mastery finds the subtle cracks within Matisyahu’s beat boxing to propel the music beyond anything it’s ever achieved previously. What makes this music so engaging and unmatched, is that Matisyahu; a vocalist with no other instrument at his disposal, is an integral creative part in the improvisation. Dugan and Marscher work well beyond the constraints of the “solo” constantly working to modulate the improvisation, while Brook’s pocket is so deep and harmonically smart, that regardless of how far the melodic elements of a jam may get pushed, it’s impossible not to feel rooted to the core of any tune performed. Matisyahu allows his band to breathe within each tune, finding his place with a wordless melody that serves to enhance the harmonic elements of an improvisation, developing the rhythmic ideas with his beat boxing, or crowning a jam with a full-on lyrical call-to-the-heavens and the great unknown. It’s that cathartic moment as a jam summits and the audience lets out its release that tells the performers we are all in it together. During the most recent Fall 2015 tour, video and audio posts of these moments inspired a steady stream of comments and inquiries asking, “What album is this song on?” It’s not on any album. It is the song of that moment, and that moment only. These moments have the ability to connect the many different kinds of Matisyahu fans. The fan going through a hard time, looking to connect to lyrics about faith and searching. The fan looking for that unmatched connection inherent in the risk-reward of improvisational music. The fan who finds pride or representation in some of the ancient sources of Matisyahu’s inspiration. All of these fans share the space together with Matisyahu who is now both a player and a playee, bound to his bandmates’ creation in song and in spirit. It’s been more than a decade for Matisyahu the singer; this is the time of Matisyahu the band.